Infant UV Play Shade protects your children from effects of the sun. It offers convenience, ease of assembly, storage, and the highest UPF rating available at 50+ UPF. The patented structure pops up and down in seconds. 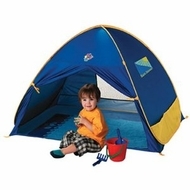 It is made of waterproof polyester and is great for indoor or outdoor use. Includes hold down pegs and "Go Anywhere Bag"